ophthalmologists at the best hospitals. 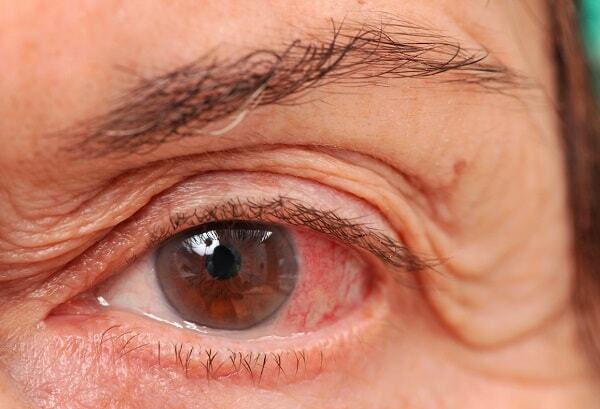 If you are suffering from glaucoma disease, you must act quickly. The more you procrastinate the worse your glaucoma becomes. 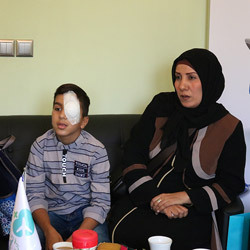 Glaucoma surgery is offered by modern eye hospitals in Iran at the most affordable prices. For more information contact us or fill out the above form. To learn more about glaucoma, read this article. Glaucoma surgery is a surgical procedure for fixing drainage problems of the eye, which are caused by high intraocular pressure. The anterior chamber (space inside the eyeball between the iris and the endothelium) is filled with a clear fluid called aqueous humor. This watery liquid bathes and nourishes the cornea and the eye lens. As the aqueous humor flows in from the posterior chamber, it continuously drains through the trabecular meshwork (between the iris and the cornea). The pressure inside the eye normally depends on how balanced the aqueous humor flows. Glaucoma is an eye disease caused by the increased intraocular pressure which damages the optic nerve that could lead to permanent blindness. In glaucoma, aqueous humor drains out too slowly or is produced too quickly. This unbalanced flow of aqueous humor is causing a fluid buildup in the eye and as a result, the intraocular pressure rises in the eye. The increased pressure in the eye damages optic nerve fibers and if not treated, these fibers will die eventually, which may result in permanent vision loss and blindness. 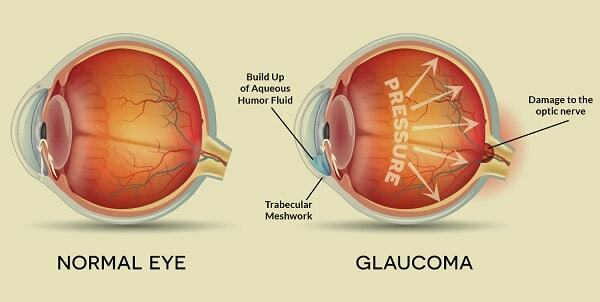 Glaucoma surgery intends either to eliminate the cause of glaucoma or to facilitate the flow of aqueous humor. 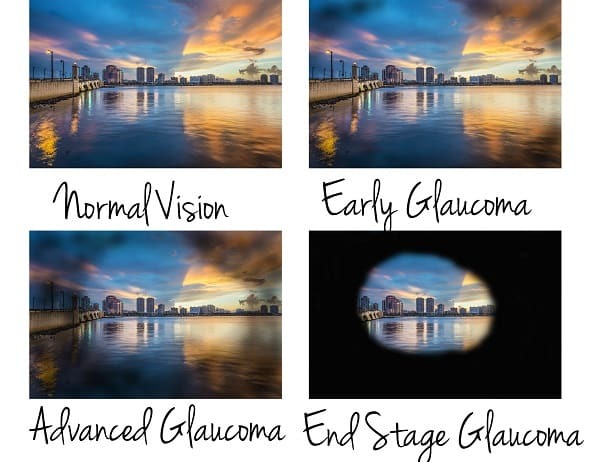 Different phases of the development of a glaucoma disease. The more the disease progresses, the more the visual field decreases. 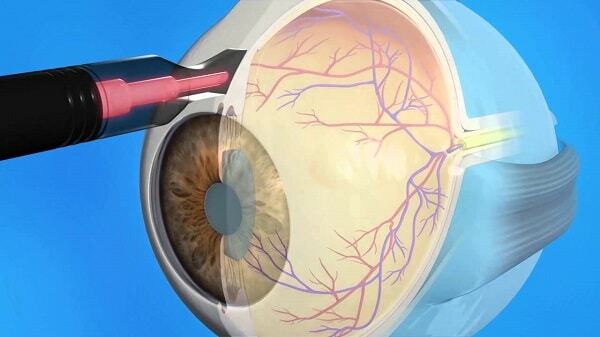 There are laser and non-laser options for glaucoma treatment. Trabeculectomy (a non-laser procedure) is an incisional surgery that removes some of the trabecular meshwork in the eye. During this process, a tiny piece of tissue from the conjunctive is removed, using surgical devices, leaving a small hole through which the aqueous humor can drain out and be reabsorbed, into the bloodstream. Trabeculectomy is a surgical procedure for glaucoma treatment that removes some of the trabecular meshwork in the eye. Trabeculoplasty; a laser procedure that increases fluid drainage from the trabecular meshwork. 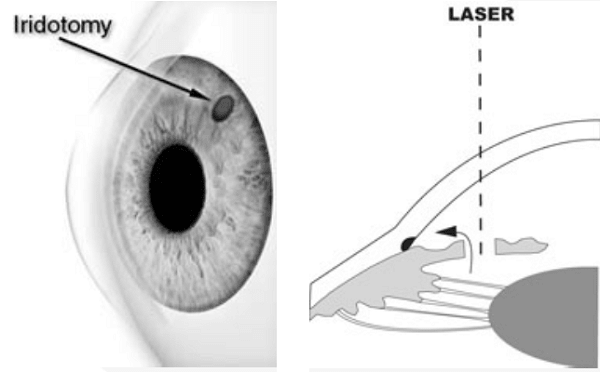 During trabeculoplasty, a special contact lens is held over the front of the patient eye to help to focus a beam of laser light onto the trabecular meshwork. This will allow more fluid to leave the eye, which will result in the intraocular pressure to be lowered. In another option called peripheral iridotomy, a narrow or closed drainage angle is opened between the cornea and iris using a laser. This closed angle is interfering with the drainage of fluid. In this procedure, the laser is used to make a small hole in the iris to allow the fluid to pass freely within the eye. In peripheral iridectomy, a laser is used to make a small hole in the iris to allow the fluid to pass freely within the eye. In cyclophotocoagulation, a laser is used to destroy parts of the ciliary body which produces aqueous humor. The third option is cyclophotocoagulation or CPC; a laser procedure that reduces production of aqueous humor the ciliary body. In this procedure, laser is used to destroy parts of the ciliary body which produces aqueous humor. 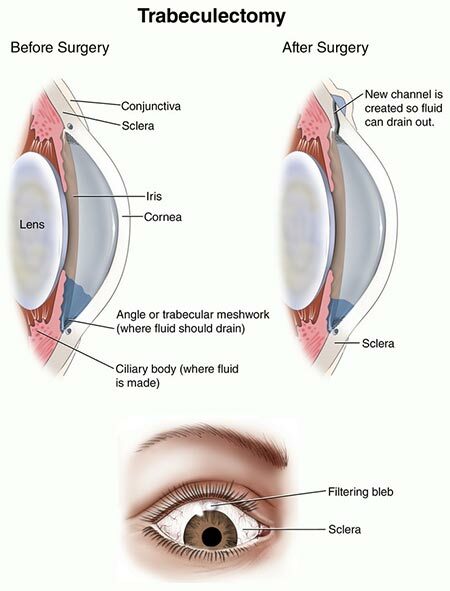 If successful it will reduce the production of fluid and consequently decrease the pressure in the eye. After the glaucoma surgery, the patient will be monitored for one to two hours before leaving the hospital. The patient’s eye also is temporarily covered by an eye patch or bandage. Moreover, a follow-up appointment will be scheduled on the same day or the following day to check the progress of his or her treatment. Further check-ups can also be arranged in the following months to measure the enhancement of his or her vision. The patient needs to take antibiotics and anti-inflammatory medicines for a few weeks after the surgery to stop possible infection. He or she will also be prescribed eyedrops and will be instructed on their use. The ophthalmologist will likely advise the patient to keep the eye dry for a time by avoiding swimming or showering. The patient should also temporarily refrain from driving, straining, exercising or heavy lifting. While medications and treatments may help prevent further vision loss in glaucoma patients, vision loss that has already caused by glaucoma is not reversible. Disrupted vision, bleeding and infection inside the eye, low eye pressure, scarring, and cataract are possible side effects of glaucoma surgery. Although there are risks associated with glaucoma surgeries, it is also important to recognize that the vast majority of glaucoma surgeries are successful and effective at slowing the progression of glaucoma and balancing the standard pressure inside the eye. 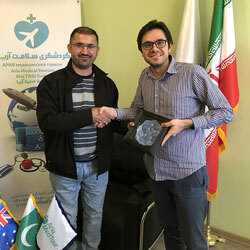 Low cost of glaucoma surgery, availability of highly skilled surgeons and experienced paramedical staff, accessibility and concentration of all facilities, availability of the best clinics and hospitals, advanced technology and high success rates are the main reasons why a person from overseas can choose Iran as the preferred place for glaucoma treatment. 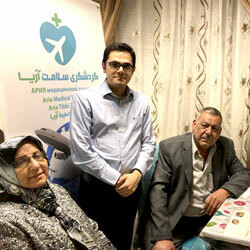 Hospitals that perform glaucoma surgeries in Iran are equipped with the latest technology and trained staff. The top hospitals for glaucoma surgery in Iran (in cities like Tehran, Shiraz, Mashhad, Isfahan and Kish Island) are equipped with technologies used to conduct both the glaucoma laser treatments and the non-laser procedures. These hospitals are also equipped with emergency services, clinics and medical laboratories available 24/7. The price of glaucoma surgery significantly varies depending on the type of the treatment and the country where the surgery is performed. A glaucoma surgery in Iran costs approximately $1600 per eye. A glaucoma surgery in other countries cost much more than Iran. In Australia, for example, it can range from anywhere between $2,600 and $3,700 for each eye. In Singapore, the cost of glaucoma surgery is approximately $3,700 for one day stay in hospital. In the UK Trabeculectomy surgery, under local anesthesia costs between £3,200 to £3,500 per eye for an outpatient procedure. Also, aqueous shunt implantation (devices that are used to reduce the intraocular pressure (IOP) in glaucoma by draining the fluid) costs between £3,500 and £4,000 or higher (for general anesthetic) depending on the hospital. Furthermore, follow up visit costs approximately £150 depending on the clinic. Fortunately, because of the availability of clinics specialized in these types of eye surgeries, the price of glaucoma surgery in Iran is a low fraction of its prices in other countries. If you have any questions regarding the costs of glaucoma surgery in Iran, please contact us on one of the messaging apps provided below or fill out the online form. Once we receive your inquiry, we will contact you to provide you with detailed information. Our costs are transparent and prices include surgeon’s visit and surgery, hotel, transfer, and interpreting services.